"Fear is a friend whose presence is felt long after he's left!" Profile: Dreadwind is the proverbial "deactivation of the party," a mournful presence always first to look on the bleak side of things. Grim and gloomy, he always acts as if his best friend has become permanently inoperative. Most other Decepticons avoid him like the plague, knowing that however buoyant their mood, Dreadwind is sure to bring them to Earth with a bump! As ominous as a storm cloud and as chilling as a winter breeze, Dreadwind somehow manages to convey his doom-laden message when he's in battle, even in jet mode! Foes have been known to feel despair at Dreadwind's approach, even at a vast distance. Dreadwind doesn't appreciate the advantage this gives him in battle; it just serves to further depress him. He's been known to wade through a battlefield, blasting Autobots and shouting, "Why does no one like me?" But Dreadwind has been known to come close to reveling (in his own low-key way) in the carnage he wreaks, knowing that perhaps his only true friend is fear. He sees it in the visual receptors of enemies and feels slightly better himself. Though the two profess to hate each other, and certainly detest combining to form Dreadwing, Dreadwind and Darkwing are the perfect partners in crime, almost trying to outdo each other in the bleakness stakes. The same cannot be said of Dreadwind's binary-bonded human component, Hi-Test. He's a thrill-seeking, overachieving perfectionist who can't understand Dreadwind at all! How can he be so gloomy when there's so much wonderful badness in the world? Hi-Test does his best to bully Dreadwind into enjoying himself, or at the very least concentrating his morose mind on the job at hand. 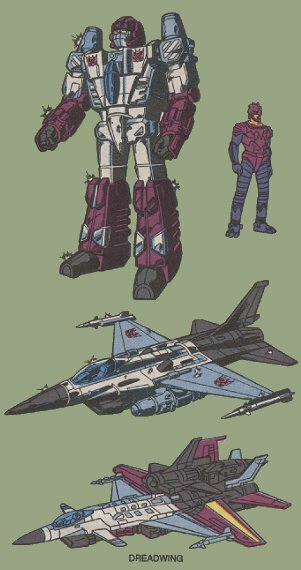 Abilities: In jet mode, powered by his high-performance Powermaster engine, Dreadwind can reach speeds up to Mach 2.6, and is able to climb to sub-orbital altitudes. When combined with his fellow Powermaster Darkwing, as the vehicle Dreadwing, they become capable of space flight, reaching light speeds and beyond. His jet mode is armed with air-to-air missiles, thermal melters, rapid-fire machine guns and lasers. He's a flying armory with a vast capacity for devastation. In robot mode he's more cumbersome and less effective, presenting an easy target. But at close quarters, his bulky strength and multi-shot wrist guns give him an advantage. Weaknesses: All of Dreadwind's weaknesses stem from his continual brooding and permanent depression. He's so busy feeling sorry for himself, he tends to forget he's in the middle of a battle, leaving himself wide open to attack.